A barbecue rub is simply a combination of spices that when applied will enhance the flavor of the food you are cooking, traditionally meat, poultry or fish. The rub is "rubbed" onto the meat, sometimes just before placing the meat over the coals or hours (sometimes days) in advance to allow the flavors to be absorbed by the meat. The most common ingredients tend to be salt and pepper, with 327 B.C. being the first known written recording of pepper being used as a spice. At various times throughout history, pepper has been used as a currency, sometimes trading higher than the price of gold (1488 AD) and actually being used as payment for ransom in Rome. One of the great things about BBQ is all the tweaking and experimentation you can do with rubs and sauces. You haven't really become serious about great barbecue until you have tried creating your own rub. I'll provide you with great rub recipes and links to websites that sell great rubs. Heck, I might try to convince you to try the rubs we came up with a few years ago. I use them all the time. But, promise me you will experiment with creating your own rub. It's easy to do and you'll feel like you are ready to hit the competitive barbecue circuit when you are done. Questions for Dave? Click Here! Dry barbecue rubs are some of the easiest flavor enhancing ingredients you will create, but you definitely need to have some basic stuff to make it worth your time. Non-aluminum mixing bowl: Some spices react with aluminum. Use plastic or glass. Funnel: You don't want your rub spilling all over the place when you are transferring it. Spice Grinder: I use mine a lot to get the rub to the consistency I desire. Zip lock plastic bags: A good way to store your finished rubs. Air tight shaker: A great way to keep your favorite rub near you on the stove and at the grill or barbecue. Sifter: Takes out large, bulky pieces if you weren't able to grind it. Fresh spices always make for the best results, but don't freak if you have to use an older spice now and again, especially if you have a grinder. A quick grinding will go a long way to releasing the flavor, even in an old spice. 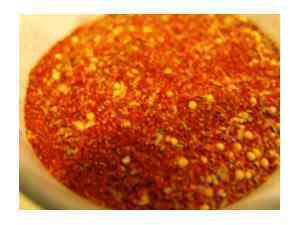 All dry rubs have a base spice, which is typically Paprika. Texas rubs tend to be saltier because they are used primarily on beef, while pork rubs tend to be sweeter. Let's review some of the spices used in rubs. Leave Barbecue Rub and Return to BBQ My Way Homepage.